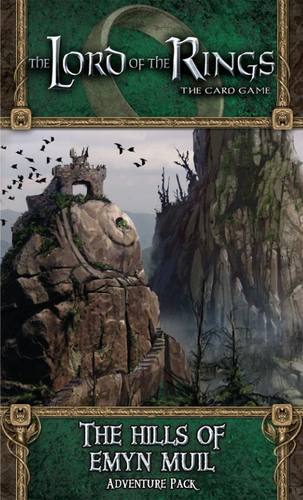 The Hills of Emyn Muil is the fourth adventure in the Shadows of Mirkwood series of adventure packs which expand The Lord of the Rings: The Card Game. The story pits the heroes exploring these barren and dangerous hills, avoiding pitfalls, and continuing their quest to track down the creature Gollum. This expansion is unique in many ways. In terms of the number of players, it is probably more difficult, the more players are present, which is something of a rarity. The quest features only one card, and this requiring only one progress token to complete, with the adventure rather based around exploring locations and collecting a certain number of victory points. It has a difficulty rating of 4, putting it on a par with “Journey Down The Anduin” from the original set, and the first expansion The Hunt for Gollum. However, if players have been playing the adventure packs in sequence, with the extra cards they should much more easily be able to tailor their hands to suit the job in hand, and as such I found this quest much easier than “Journey Down The Anduin”, for example. Nevertheless, that alone can’t be used as criticism, and indeed the lighter difficulty comes as a pleasant refrain from the challenges of the previous adventures. Still, the most common complaint about this adventure is that it is seemingly monotone. Depending on what sort of player you are, this scenario might feel extremely barren and uninteresting, but on the other hand if you managed to read The Lord of the Rings without skipping over the endless songs and descriptions of walking through the landscape, it might be far more up your alley. Despite being location-heavy, some of the larger enemies from the core set are present, as is a new enemy whose attack strength increases according to the number of locations present, and in particular there are some extremely exasperating Treachery cards to keep you on your toes and prevent this adventure being a walkover. Yet by way of design the adventure throws its ‘big guns’ at you in the opening volley, and if you survive the first few rounds you might find yourself having an army of allies standing around with little to do by the eventual end. One of my biggest criticisms of the adventure packs thus far has focused on the player cards, which were often released in an entirely pointless order. By this stage, however, if you’ve been buying the packs in order, most of the cards start to come into their own, and the ones in this set offer a pretty good selection, including a few which are obviously useful to this scenario. The hero in this pack is “Brand, son of Bain”, a character similar in stats to Legolas, but whose ability is very coop oriented, a nice addition for people not playing the game solo. The Tactics sphere gets another pair of eagle cards, Spirit continues in a Rohan vein and gets their song card (resource generator), Lore has an extremely powerful ally, whilst Leadership gets… well, arguably the most useless card in the game so far. By and large though, the cards make excellent additions and can prove very useful for this scenario in particular. As one of the easier expansions, it’s somehow a shame that this adventure wasn’t earlier on the list. Whilst some might find it dull, if it doesn’t bother you that the enemies are very sparse, it offers a nice break and a bit of variety, without being a complete walk in the woods. The design is a little flawed in that it tends to start off hard and gradually get easier, and the lack of any progression in the storyline leaves exploring the locations relatively monotonous, but these factors are arguably made up for by the usefulness of the included player cards. He can’t decide whether to leave his visor half open or half closed.